In kind donations being sought by the Skatepark project. The Portsmouth Skatepark is one step closer to becoming a reality after receiving two large grants last week. 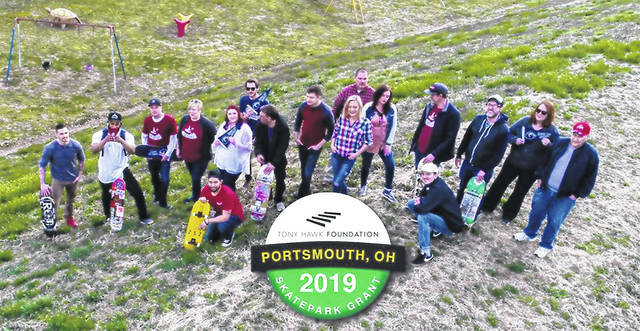 According to City Councilman Sean Dunne, the Portsmouth Skatepark Project received a $156,000 grant from the Ohio Department of Natural Resources and an additional $10,000 from the Tony Hawk Foundation. “On November 15 we submitted our grant application to ODNR, which is responsible in the state of Ohio for overseeing distribution of funds for the state of Ohio from the federal fund of the land and water conservation fund. They informed us at the end of last week that our grant application was successful for $156,000,” said Dunne. 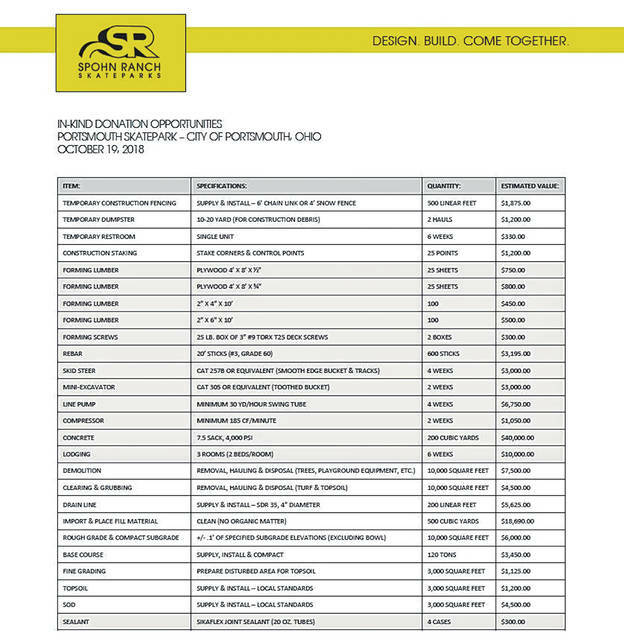 “It’s great news, for several different reasons.” Dunne pointed out that Huntington, WV received only $50,000 from the same fund, showing the Portsmouth project scale as nearly 3 times as large. “We are grateful for the funding knowing all the other projects that were also seeking that grant,” said Dunne. Dunne stated for him personally it was the collaborative efforts of Portsmouth City Health Department, Community Economic Development Office, City Manager, City Council, City Solicitor, City Clerk, members of the community who wrote letters of support, people that volunteered hours to write grants, Shawnee State University Faculty, and Shawnee State University Students that made it possible for the Skatepark Project to reach this important milestone. “It really was the result of what happens when people collaborate together and it’s just brilliant to see,” said Dunne. Dunne stated that with the project size and now accreditation, it would take an individual at least two hours from Portsmouth to reach a park as good as the one currently in the works. “With the size and accreditation, I’m confident we will start bringing in people outside of Portsmouth once the park is built,” said Dunne. Dunne said that in addition to the continued search for grants, in kind donations are an important “next step” for the project to move forward, in the form of either material or labor. Dunne stated if those needs are met and the project stays on track, the park could be built as soon as Thanksgiving. “The significance of these two grants, the hard work that our city and community has put into it, we’re really seeing it pay off and it’s great to see,” said Dunne. https://www.portsmouth-dailytimes.com/wp-content/uploads/sites/28/2019/04/web1_SP1.jpgIn kind donations being sought by the Skatepark project.